Looking for an easy Easter craft for younger kids and toddlers? 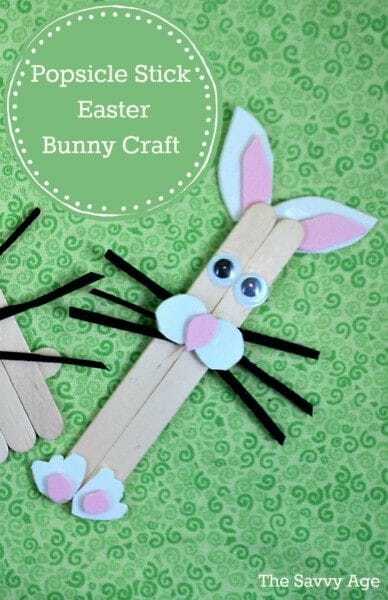 Popsicle Stick Bunnies For Kids are fun Easter basket stuffers and kids of any age can participate in making homemade Easter crafts. 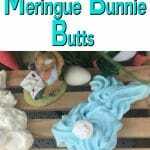 Make one, make a few or use the dollar store to make Easter bunnies for a group. For the big popsicle stick bunnies I used 11 popsicle sticks, but any number works. The number of popsicle sticks used to make the base of the bunny head will determine its’ size. Two popsicle sticks will always be needed to make the base. 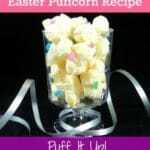 The width of the popsicle or craft sticks used does not matter for this Easter craft for toddlers or kids and adults of any age. Lay out two popsicle sticks horizontally. These popsicle crossbars will be the base of the bunny. Lay out the popsicle sticks vertically across the two crossbars. This will give you an idea of how many popsicle sticks are needed and how close to glue the popsicle sticks together. Glue the sticks across the crossbars. To save time, simply line each crossbar across with glue and then glue the vertical popsicle sticks one by one across. I use Weldbond glue as the glue is non toxic, friendly to children and dries clear. While the body of the bunnies are drying, cut out the white bunny ears and the pink interior of the ears. Glue the pink inside the white bunny ears. Attach the ears to the back of the popsicle stick bunny. Cut out whiskers from black foam paper. Place (without gluing) the two googly eyes and the pom pom for the nose on the bunny. Mark with pencil a small dot to indicate where the pom pom for the nose will be glued. Glue the whiskers to the area of the marked dot. Now glue the pom pom as the nose. The small popsicle stick bunny can be made with two popsicle sticks and the same materials as used above except with smaller googly eyes and a touch more time cutting foam paper. 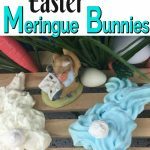 Either project is a quick and easy Easter craft for kids or grandchildren and the materials are economical and easy to find. 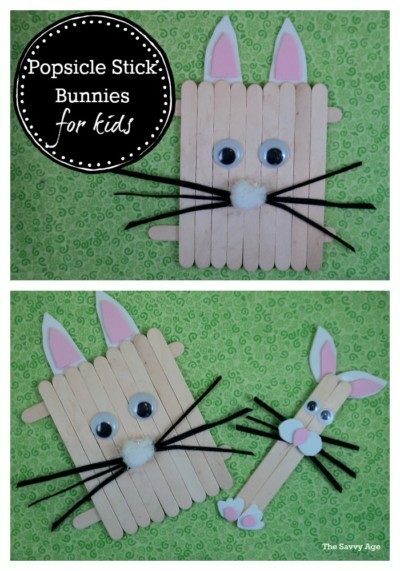 Learn how here and you are on the way to making two versions of Popsicle Stick Bunnies!